"For a brief moment in America, a little brown racehorse wasn't just a little brown racehorse. He was a proxy for a nation." You may already have read the book, and the feature film is due out in a matter of days, but there's nothing like the truth, and this documentary on one of the most celebrated racehorses of the twentieth century has enough inherent drama and gripping improbabilities for at least a couple of movies. Produced for the PBS series American Experience, this film tells the story of Seabiscuit, one of the greatest racehorses of the 1930s, and his unlikely odyssey to glory. The confluence of the keen eye of his trainer, Tom Smith; the ambition of his owner, Charles Howard; and the perseverance of his jockey, Red Pollard, make for a fairy tale that would be dismissed for its lack of plausibility were it not true. 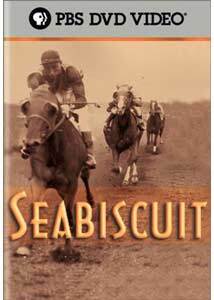 The filmmakers were blessed with not only a great story, but a treasure trove of material�both Howard's and Pollard's families had been hoarding Seabiscuit memorabilia for decades, and there's a tremendous amount of archival footage in respectable condition, ranging from Seabiscuit at the track to the home movies of the Pollard's wedding. Scott Glenn narrates this rags-to-riches equestrian tale: Smith spied Seabiscuit at Suffolk Downs in Massachusetts, where the horse was an overrun, undertrained two-year-old; Smith convinced Howard to take a gamble, for a paltry $8,000, sensing that greatness might be lurking. This was an awkward horse, with a strange gait and without a regal bearing; on looks, his archrival, Triple Crown winner War Admiral, had it all over him. The film does a fine job relating the crucial elements of the story in a relatively short period of time; the emphasis is decidedly upon Pollard, an oversized jockey lucky to survive a couple of calamitous racetrack mishaps. Seabiscuit also became a star figure, and the film is especially interesting in providing historical context�horse racing was the only legalized form of gambling during in those years, the nadir of the Great Depression, and the horse had a series of endorsement deals that would be the envy of Tiger Woods. Seabiscuit's likeness was used to hawk hats, oranges, hotels, and dry cleaning, and his most fruitful years coincided with the ubiquitous spread of radio. The horse was one of the big stars of the new medium. The movie is of course scored with the music of the period, and it's always a treat to hear the likes of Fred Astaire and Bing Crosby. Music also does well in highlighting the divide between the East Coast racing establishment and the young Western upstarts, who were concentrated mostly at Santa Anita. The film is brimming with information about the horse and his time; if this doesn't sate your appetite for the Biscuit, check out Hillenbrand's book, and the upcoming feature film based on the same. Image Transfer Review: The archival footage varies in quality, but overall the transfer to DVD is a clean one, and the newly shot interviews are tastefully lit and shot with understatement. Audio Transfer Review: There's a little too much reverb on Scott Glenn's narration track, but otherwise things sound pretty fine. Extras Review: In a brief interview (04m:58s), Stephen Ives, the director of the documentary, discusses boiling down Hillenbrand's book, and his good fortune in finding so much archival material. Weblinks are provided to PBS and the documentary's companion website; a Superhorses Gallery offers brief panels on ten thoroughbred champions, from Man o' War to Seattle Slew, with a full account of their lifetime earnings. Giddayup. A couple of dollars down on Seabiscuit to win is a good safe bet. A smart and intelligently assembled look at the horse and what he meant to the nation.